Concert Band is a year round class and is comprised of 9th, 10th, 11th, and 12th grade students. 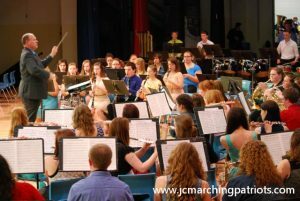 The Concert Band focuses on refining instrument playing skills and performing quality music literature of a medium difficulty level. This large performing ensemble is open to all instrumentalists. Students perform a wide variety of music during the year, performing several concerts. Students develop the ability to understand and convey the composer’s intent in order to connect the performer with the audience. Students are required to participate in performance opportunities, outside of the school day, that support and extend learning in the classroom. Away/overnight trips are possible. All costs may be defrayed through fundraising opportunities.